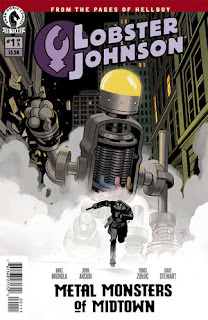 The Fellowship was fortunate enough to obtain a copy of LOBSTER JOHNSON: METAL MONSTERS OF MIDTOWN #1 from Dark Horse Comics. Mike Mignola and John Arcudi write, Tonci Zonjic draws, Dave Stewart colors, and Clem Robins letters. A pair of giant robots are rampaging through Times Square, smashing the front of a bank. Police bullets are having no effect, but the Lobster is quickly on the scene. His grenade launcher doesn’t help much either, but the robots leave. Round two happens the next night, and the Lobster has a couple of tricks up his sleeve by then. The Lobster is a great character, and it’s always fun to see him in action. He’s a normal guy (though an impressively tough one) in a world with supernatural horrors. And yet he keeps fighting, with the help of his group of associates. The stories, including this one, always push him to his limits, and the art is always top-notch (I especially like the detail in the robots). If you’re into the quiet vigilante types who fight evil however they can, or if you think you might like to check one out, this book is a great place to start. LOBSTER JOHNSON: METAL MONSTERS OF MIDTOWN #1 is available now at your FLCS or at darkhorse.com.